Transport between India and Pakistan has been developed for tourism and commercial purposes and bears much historical and political significance for both countries, which have possessed few transport links since the partition of India in 1947. In 1977, both nations launched the Samjhauta Express connecting the Indian city of Attari with the Pakistani city of Lahore . Since the successful launch of the Delhi-Lahore Bus in 1999, both nations have worked to established multiple bus and train services connecting cities across the borders in the Punjab region and Sindh as well as between Indian-administered Kashmir and Pakistan-administered Kashmir across the Line of Control (LoC) the boundary line denoting rival areas of control in the disputed region of Kashmir, but which is not an official international border. 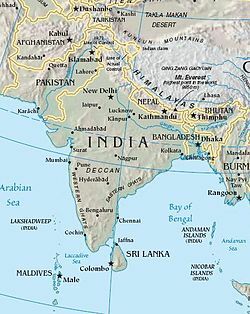 The partition of India in 1947 led to the termination of most transport links between the newly-independent nations of India and Pakistan after the cross-migration of peoples was completed by the 1950s. The First Kashmir War had similarly divided the Himalayan region of Kashmir between the two rivals, causing termination of road links in the region. Kashmir and the international border in the divided region of Punjab were major theatres of war during the Indo-Pakistani Wars of 1965 and 1971. The train connecting the Indian city of Jaipur with the Pakistani city of Karachi across the Thar Desert was destroyed when the Pakistani Air Force bombed the tracks during the 1965 war. In the 1990s, the Line of Control  (LoC) demarcating the informal boundary between Indian-administered Kashmir  and Pakistan-administered Kashmir  was the scene of exchanges of fire between Pakistani and Indian forces and infiltration of militants into Indian Kashmir. The Kargil War of 1999 broke out when Indian force sought to repel militants and Pakistani soldiers who had infiltrated across the LoC. As per the Shimla Agreement of 1972 and in a bid to restore peaceful ties after the Indo-Pakistani War of 1971, both nations launched the Samjhauta Express (Samjhauta means "accord" or "compromise" in Hindi and Urdu, the national languages of India and Pakistan respectively) connecting the Pakistani city of Lahore with the Indian town of Attari , which is close proximity to the city of Amritsar . The Thar Express was launched to connect the Pakistani city of Karachi through the Munabao station and the Indian city of Jaipur through the Khokhrapar station. Plans and negotiations are underway to launch a train service connecting the Pakistani city of Sialkot  with the Indian city of Jammu. On February 18, 2007, 2 carriages of the train experienced alleged terrorist bombings near Panipat ,Haryana in India. The 2007 Samjhauta Express bombings claimed lives of 68 people. Both the Indian and Pakistani governments condemned the attack, and officials on both sides speculated that the perpetrators intended to disrupt improving relations between the two nations. The Delhi-Lahore Bus is a passenger bus service connecting the Indian capital of Delhi with the city of Lahore , Pakistan via the border transit post at Wagah , which is the only border crossing point between India and Pakistan opened for international travelers. The bus was of symbolic importance to the efforts of the governments of both nations to foster peaceful and friendly relations. In its inaugural run on February 19, 1999, the bus carried the then-Indian Prime Minister Atal Bihari Vajpayee, who was to attend a summit in Lahore and was received by his Pakistani counterpart, Nawaz Sharif at Wagah. Its official name is the Sada-e-Sarhad (Urdu for Call of the Frontier). The duration of the entire journey is 8 hours, covering a distance of 530 km (329 mi). While the bus service had continued to run during the Kargil War of 1999, it was suspended in the aftermath of the 2001 Indian Parliament attack on December 13, 2001, which the Indian government accused Pakistan of instigating. The bus service was resumed on July 16, 2003 when bilateral relations had improved. In 2003, after a ceasefire in Kashmir improved bilateral relations, the two governments worked on the proposal for a bus connecting the city of Srinagar in Indian Kashmir to the city of Muzaffarabad in Pakistani Kashmir . The official agreement was promulgated on February 16, 2005 when the then-Indian Minister of External Affairs K. Natwar Singh visited Pakistani President Pervez Musharaff in Rawalpindi , Pakistan. The decision was announced along with agreements on establishing the Thar Express train service. The bus runs a distance of 183 kilometres and was officially launched on April 7, 2005 and was flagged-off by the Indian Prime Minister Dr. Manmohan Singh. The service was suspended for some time after 2005 Kashmir Earthquake due to aftereffect of road damage. A bus service connecting Poonch (India) with Rawalkote (Pakistan) over 55 km was also launched on June 20, 2006. On June 5, 2008 the passenger quota on the Poonch-Rawalkote Bus was doubled. Bus services connecting Kargil (India) with Skardu (Pakistan), Jammu (India) with Sialkot (Pakistan) and Mirpur (Pakistan) are also being planned. The Indian official position viewed the Srinagar-Muzaffarabad bus service as a "humanitarian measure without prejudice" and not affecting the rival policies and stands of the two governments on the Kashmir conflict. To make the bus safe and fully operational, the LoC would demined if and where necessary and other security arrangements would be made as well. Both governments announced that Indian and Pakistani citizens could travel anywhere in Indian Kashmir and Pakistani Kashmir, including the Northern Areas of Pakistan, which are part of India's claim on Kashmir and pre-1947 Kashmir. In India, all citizens would have to apply at the Regional Passport Office in Srinagar, which was the designated authority to evaluate applications, verify identities and issue entry permits. Air India and Pakistan International Airlines, the respective national carriers run regular flights connecting the Indian cities of New Delhi and Mumbai with the Pakistani cities of Lahore and Karachi. However, most flights are routed through a transit point in the Middle East.